The Jaguar is a top notch luxury automaker that is known for its expensive yet appealing and admiring vehicles. For the 2014, Jaguar decided to surprise all its enthusiasts by stepping in the segment of roadsters with an all new F-Type model. In its 40 year long history, this will be for the first time that the brand launches a high end luxury roadster. The all new 2014 Jaguar F-type is basically a convertible that delivers a blend of jaw dropping performance, eye watering style and class leading luxury. Jaguar designed and manufactured the new roadster thoroughly and so it lust will attract all the enthusiasts regardless of their priorities. Just like other Jaguar vehicles, the 2014 F-Type also has a unique feel of styling that make you stare at even if you are not a lover of sports roadsters. The exterior of the car features automatic bi-xenon headlights, headlight washers, daytime running LED lights, rain sensing wipers, heated side view mirror and a deployable rear spoiler. The S trim adds power folding mirrors, large performance brakes, gloss black accent and adaptive suspension system. The V8 S trim adds rear parking sensors, high performance brakes and auto dimming side mirrors. 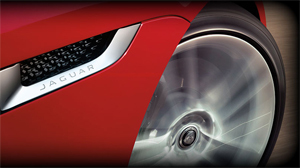 The F-Type rolls over 18”, 19” and 20” wheels respectively. The new 2014 F-Type is offered in three trims, the base, S and V8 S. The Jaguar F-Type is basically a two seat roadster with a fabric top and the British automaker offered almost everything that is important for a high performance luxury roadster. Standard base interior features include full power accessories, leather and suede upholstery, auto dimming rearview mirror, cruise control, interior ambient lighting, automatic climate control, six way power adjustable seats, power tilt and telescoping steering wheel, an 8-inch touchscreen display Bluetooth, navigation system, 10 speaker sound system with a CD player, iPod interface and auxiliary audio jack. Moving up to the upper trims you will get some more powerful and technologically advanced features. Jaguar also offered some optional packages including Premium 1 and Premium 2 Package for the Base and S trim whereas a Premium 3 package is offered for the V8 S trim. Another package is also available that adds additional features to the premium packages named the Vision Pack. Rollover protection bars, seat mounted side airbags, antilock disc brakes, traction control and stability control are standard on all F-Type. Two engine choices are available for the F-Type 2014. The Base and S trims are powered by a 3.0 liter Supercharged V6 engine generating 340 horsepower and 332 lb ft of torque. Rear wheel drive and an eight speed automatic transmission with manual shift control are standard on all F-Type models. On the S trim, the engine delivers 380 horsepower and 339 lb ft of torque with acceleration from 0-60 mph in 4.8 seconds. The V8 S trim is powered by a 495 horsepower 5.0 liter supercharged V8 that accelerates from 0-60 mph in 4.2 seconds. With the release of Jaguar F-Type 2014, many insurance companies are keen to offer insurance quotes for the entire F-Type lineup. The insurance price and coverage can be affected by different factors including the manufacturer’s basic warranty, bumper-to-bumper warranty and state-by-state coverage. Check all these things before getting the quote. MSRP from $69,000 to $92,000 and the lineup is expected to go on sale in the first half of 2014. The two seat 2014 Jaguar F-Type is a perfect choice for those looking for a distinctive styling, British luxury and Jaguar like ride.